Welcome to my new feature: 'The Very Best of The Underground Jewelry Market.' I plan to shed light on unique and interesting Bigcartel and Etsy shops and encourage my readers to spend money on smaller, more thoughtful shops than the giants of jewelry such as Topshop, Urban Outfitters and Primark. The feature will include a little interview with each shop's founders and a personal review from me on some of their products on sale. I love to buy from smaller, online jewelry shops as you can guarantee you won't come into work or college wearing the same piece as anyone else! You also get a more personalized service including pretty packaging. You can't go wrong. Introducing the first Featurette: Delilah Dust Bigcartel Shop. How long have you had your online shop and what inspired you to start? 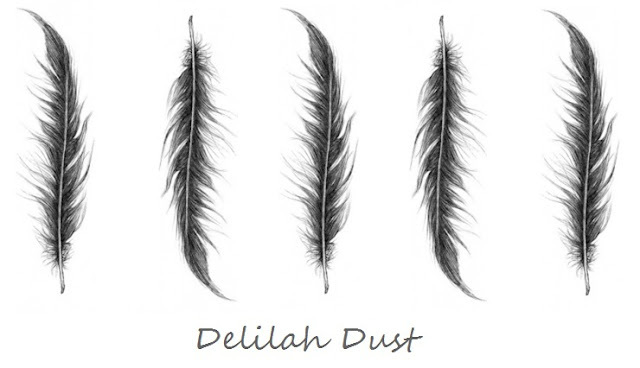 I set up Delilah Dust in November 2011, after several months trying to decide what to sell! I eventually decided on jewellery, as I can't leave the house without a bracelet or a necklace on! So, with the help of my sister Dominique, I started up a website with 4 products, which is gradually expanding! Simple, yet unique - perfect for everyday wear, or as little gifts for friends and family. Where do you hope to take your work in the future? In the next few years, I would love to have a wide range of jewellery products selling on my website, and I have so many ideas I'd love to try out. I eventually would love to own my own store and vintage tearoom, as I also love baking! The items arrived B E A utifully packaged. The classy silver card shows off the products perfectly and I love the sweet little hearts punched out. The bracelets are all designed to tie around the wrist so they can accommodate wrists of all sizes and can be worn as loose or tight as you like. They look sweet layered together or alone and I think they would make the most perfect gifts for friends or family. They come in a range of designs and you can choose the colour of your tie from a selection of 14 different colours. I love how dainty these designs are and I haven't taken them off since I put them on! Delilah Dust also do necklaces so be sure to check out their website, here. Delilah Dust are also giving 10% of sales to Breast Research until 1st April 2012 so make sure you put in an order quick- a treat for you AND a good deed. Win/win situation as far as I can see. Follow Delilah Dust on twitter here.